Every time I opened my closet, I averted my eyes from the horror that was the top shelf. 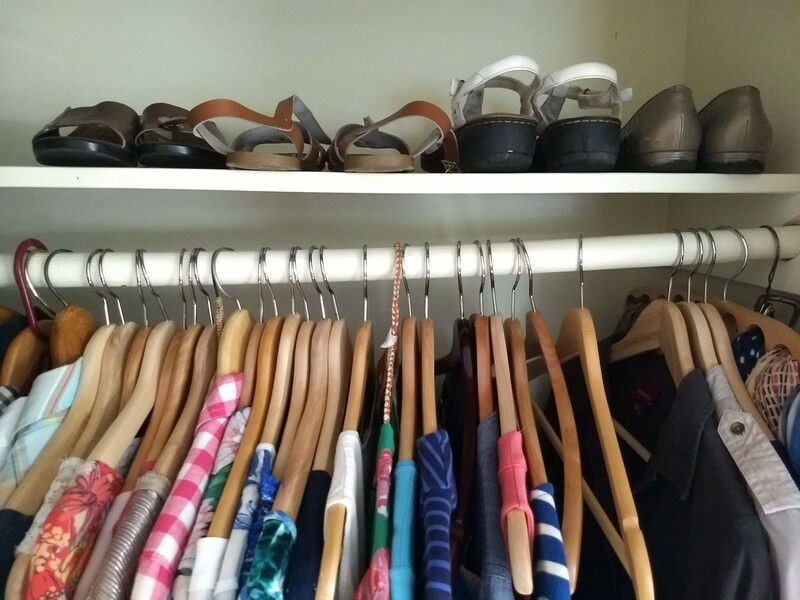 Despite how clean and uncluttered my clothes looked hanging just below, it was kind of ruining my closet mojo. I pride myself on thrifting anything I need for storage (or repurposing something I already own) – I dislike the idea of paying retail money for storage solutions, probably because there is so much out there designed to make you think you’ll never be organized without splashing out cash. But no matter where I thrifted, I couldn’t seem to find one – or anything that really could work in a pinch. So I let the shoes (and the scarves, and the router, and the…I don’t even know what some of that was?) sit in an inglorious jumble, messing with my feng shui. Until I realized I didn’t need to thrift, or even find, any storage solution. I just needed to move my off-season shoes elsewhere, and put everything else where it belonged. So the shoes I wasn’t currently wearing went in the guest room closet where we keep off-season clothes (one pair that was too tight got donated). The scarves went on the scarf hanger thingy that hangs in my closet. And the antennae/router junk (used to very, very occasionally watch network tv and stashed there to keep out of the reach of my kid, who kept messing with it) went in a box and into the guest closet shelves where it could easily be set in the guestroom, where it gets the best signal. 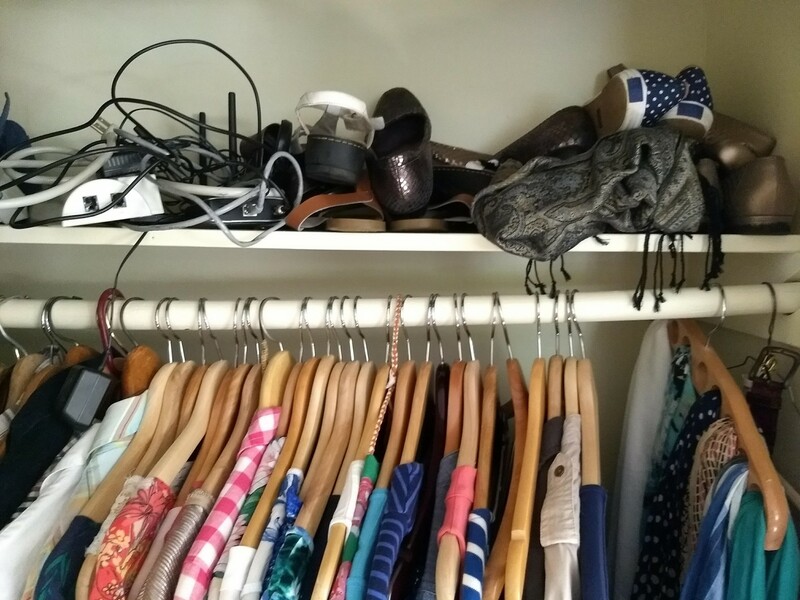 What corner of your house has been waiting – so you think – for that perfect storage solution but really just needs a clear out or something as simple as a repurposed shoebox? I’m glad you got your closet mojo back. :-) It looks great.